? If CBSE Increase Decrease any points either it is from Scholastic or Co-Scholastic, software is smart enough to handle these.
? No need to worry about credibility of the software already running successfully in some Top schools of India.
? If Generating Report Card for Class X, the no need to re-enter back year data of class 9th . It will automatically club with the back year Data and will display at specified place.
? Option to Increase/decrease no of subjects and their sorting order.
? Only relevant Optional Subjects will be displayed on each student Report card.
? This Area has been kept Dynamic using Master Setting.
? If in future CBSE changes something else from WORK EXPERIENCE, ART EDUCATION, PHYSICAL AND HEALTH EDUCATION/GAMES, then no need to change the software, there is option to control changes asked by CBSE.
? Easy Attendance option is there to make attendance of all students in one go (Specially designed for CBSE- CCE report Card).
? Option to create different LIFE SKILLS Head for different classes. e.g. for class 5-8 and for Class 9 & 10.
? If in future CBSE changes something else from current LIFE SKILLS Head then no need to change the software, there is option to control changes asked by CBSE.
? Option to create different ATTITUDES & VALUES Head for different classes. e.g. for class 5-8 and for Class 9 & 10.
? If in future CBSE changes something else from current ATTITUDES & VALUES Head then no need to change the software, there is option to control changes asked by CBSE.
? Although the CBSE has provided 4 rows, but since CBSE has asked to assess any two on the base of child interest, we have made it dynamic. Only two CO-SCHOLASTIC ACTIVITIES will display which student has chosen.
? Option to create different CO-SCHOLASTIC ACTIVITIES for different classes. e.g. for class 5-8 and for Class 9 & 10.
? If in future CBSE changes something else from current CO-SCHOLASTIC ACTIVITIES then no need to change the software, there is option to control changes asked by CBSE. 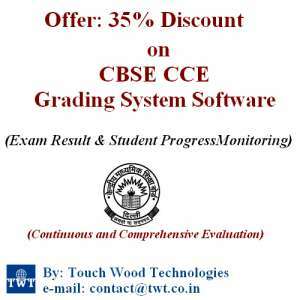 Online CBSE Continuous and Comprehensive Evaluation (CCE). Online Development of Software on CCE framework. Agra Amritsar Ayodhya Corbett Dalhousie Delhi Dehradun Dharamsala Dudhwa Gorakhpur Haridwar Kedarnath Kushinagar Kullu Ladakh Leh Lucknow Manali Noida Mukundgarh Rishikesh Rohtang Pass Sawai Madhopur Sarnath Shimla Sravasti Srinagar Uttarkashi Varanasi Nainital Central India Bandhavgarh Bhopal Gwalior Indore Jabalpur Kanha Khajuraho Nagpur Orchha Sanchi Umaria South India Alleppey Bangalore Belur Chennai Bandhavgarh Chettinad Cochin Coonoor Coorg Coimbatore Halebid Hyderabad Kanyakumari Kanchipuram Kodaikanal Kovalam Hampi Kumarakom Mangalore Madurai Mahabalipuram Ooty Munnar Mysore Periyar Tanjore Thrissur Trichy Trivandrum Varkala Vizag East India Bhubaneshwar Bodhgaya Darjeeling Dispur Gangtok Guwahati Itanagar Imphal Kalimpong Kaziranga Konark Kohima Kolkata Nalanda Patna Puri Rajgir Ranchi Siliguri Vaishali West India Ahmedabad Ajanta Ajmer Aurangabad Barmer Baroda Bharatpur Bhavnagar Bhuj Bikaner Bundi Chittorgarh Ellora Gandhi Nagar Panaji Gondal Jaipur Jodhpur Jaisalmer Kumbhalgarh Kota Mandawa Matheran Mount Abu Mumbai Nawalgarh Pushkar Ranakpur Ranthambore Sasangir Sariska Samode Silvassa Shekhawati Surat Udaipur Utelia Zainabad ? Online campus management software and education erp solution for school, college and univ.